Sports car racing veteran Spencer Pumpelly is ready to add Pirelli World Challenge to his already crammed schedule, starting this weekend at Mid-Ohio where he’ll make his debut with RealTime Racing. 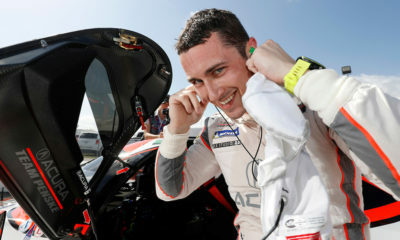 The Arlington, Va. native has been campaigning a Lamborghini Huracan GT3 for Change Racing in the IMSA WeatherTech SportsCar Championship, and currently leads the points standings in the Continental Tire SportsCar Challenge ST class along with co-driver Nick Galante for RS1. Now he’s set to jump into one of RealTime’s Acura TLX-GTs hot on the heels of the Wisconsin-based team’s dominant two-win, three podium weekend at Road America last month. That seat opened up when team principle and seven-time World Challenge champion Peter Cunningham opted to focus on helping Acura develop the new NSX GT3, which will replace the TLX next season. Pumpelly said the team reached out to him earlier in the season to gauge his interest should the need arise. “The idea came up a couple of months ago,” Pumpelly told Sportscar365. “Honda had expressed some interest in having someone on backup in case things changed, and sure enough with the way the NSX project has come along, it’s gotten busier for P.D. [Cunningham]. Pumpelly said the chance to drive for the RealTime squad was too good to pass up. “This team is a team that I’ve watched for years and years and really admired,” he said. “The fact that Acura has so much factory support here, I think any driver would jump at the opportunity to be a part of this. “This is a great team and a great car that’s capable of winning races and running up front every weekend. Pumpelly got his first taste of the Acura at a recent test at Mid-Ohio and came away impressed. “I got to do a little shakedown of the car to get a feel for it, to see how it works,” he said. “Everyone was really welcoming and supportive and gave me good help to get me right up to speed. “The car is a little bit different from what I’ve driven as far as the electronics and the engine management, things like that. While scheduling has been a challenge given his commitments in IMSA, Pumpelly is currently slotted in for the Mid-Ohio and Utah Motorsports Campus rounds with the team in PWC. He said that both of his IMSA teams and RealTime have been supportive as they juggled his hectic schedule. “I came to [Change Racing and RS1] before I said yes to [RealTime] to make sure that they were OK with everything, and they’ve been really supportive and are as excited as I am! “Unfortunately I’m not going to be able to the the [PWC] Sonoma round because there is a conflict. “The first commitment I’ve made is to the IMSA teams, I made that commitment before the season started, so when this came together I knew I wouldn’t be able to do Sonoma and everyone here has been supportive as well. When asked about the new NSX GT3, which is making its on-track debut with a demonstration run at Mid-Ohio this weekend, Pumpelly said he would would love to get a chance to drive it but added that it was too soon to be talking about the future. “That car is beautiful,” said Pumpelly. “I haven’t gone anywhere near it, I’m still new on the job! I’m not privy to anything that’s happening down the road, but it certainly looks great. “That’s the car I fell in love with back when I was 15 years old when it first came out, and the new one is just as stunning. Pumpelly was optimistic that his team debut would be a good one. “I certainly think that everything is in place here to be successful,” he said. “I have a great co-driver with Ryan Eversley. I can look at his data and talk to him about the subtleties of the car. “My expectations are tempered, but certainly in the back of my mind I think we can be really successful.